I can’t wait for Christmas Day and my first glass of white! Here’s a Christmas white wine selection to suit all pockets which you can pour as the family arrives, right through to Dad sneaking the last roast potato onto his plate. Extra Special French Chardonnay (13.5% abv, £5, ASDA) This Languedoc chardonnay is lightly oaked which brings some creaminess to the apple and citrus flavours, but don’t worry it’s not one of those in-your-face oaky assaults. It’s easy drinking but has enough personality to sit happily next to a plate of turkey and sprouts. Limestone Rise (11% abv, £7.99 The Co-op) This is an English white from the Co-op, which 15 years ago was the first retailer to sell English wine before it became the “in thing”. This blend of bacchus and ortega grapes has sherbert, elderflower, a spring breeze and a really nice little bite of citrus and acidity. La Altelana Gavi di Gavi 2015 (11.5% abv, £7.99, Aldi) The label looks classy, take a bottle to a party and wow your hosts. Or save it for yourself and it’ll breeze through the prawns and be very happy with the turkey and crisp vegetables. It’s an Italian white with hints of green in the glass, with fresh lemon aromas and subtle minerality. Fief des Pierres Blanches Quincy, 2015 (13.5 % abv, £8.99 Lidl) Mmmm … zesty! A great wine from the Loire Valley which is fresh and full of lemony aromas and tropical fruit flavours. If you’re a bit dulled from Santa’s Christmas Eve sherry this will really perk you up. Delicious. Chapel Down Bacchus (12% abv £9.99 from £12.99, Waitrose) Bacchus is the ancient Roman name for the classical god of wine. Who would have thought that my fascination with ancient history would have a nice link to my love of wine. Bacchus is similar to sauvignon blanc – think grapefruit, elderflower and gooseberry with a zesty woosh alongside. The 2015 vintage won bronze at the Decanter awards. Wm Morrison Chablis Premier Cru 2014 (13% abv, £15) Toast your Christmas Day guests with this terrific Chablis from Morrisons which has just won gold (again) at the latest International Wine Challenge awards. Chablis is perfect with a seafood starter as the vines grow on an ancient seabed. This wine has minerality, melon and grapefruit flavours, with a soft touch of vanilla. Domaine de la Mandelière Robert Nicolle 2015 (12.5% abv, £14.49 or £13.04 in a buy six deal at www.laithwaites.co.uk) This Chablis is from a small, family run estate on a ridge of limestone in the famous wine district. It is pale straw, with aromas of crisp apple and a flash of citrus, which both appear on the palate with a signature wet stone minerality. The Society’s Exhibition Pouilly-Fuissé 2014 (13% abv, £18, www.thewinesociety.com) Love, love, love! The Wine Society’s Exhibition wines aim to be the best examples of wine from a particular region – this one a classic Burgundian white. This has bright citrus but with creaminess, cushioned by vanilla and an upright flash of minerality. Fess Parker, Santa Barbara County Chardonnay (14.2% abv, from £13.95 at The Wine Society and www.amathusdrinks.com) OMG. Which in this case stands for Orgasmic, Melony, Golden. This chardonnay is barrel-fermented, aged in French oak and it’s utter heaven. You could have it with your turkey. It’s full and rich enough to go with Christmas pud. But forget that. Sit. On your own. When the house is empty. And drink it with lashings of self-indulgence. Quality Street are made for sharing. This isn’t. Christmas white wine factor: It’s just a wow. My dad used to say that he didn’t forget anything, but sometimes he just didn’t remember. I know what he meant. Let me explain. My reasoning behind this advent calendar countdown is in part to give a Christmas nod to wines I’ve tasted in my wanderings and haven’t written about; and to give a heads-up to samples I’ve received but not reviewed elsewhere. This week a reader of my print column emailed me. Yippee. I have at least one. Nicola (that’s her name) was asking where she could buy an English red wine as she’d drawn a blank. Nicola said she had wanted red as Christmas presents because that’s what her family drinks. No problem, I said, and began to search for good red wines to help her out. Then Denbies Redlands 2014 popped up in the searches followed by a #doh from me. I remembered I was sent this wine last Christmas when it launched into Waitrose, but I ran out of print space and kept the bottle for another time to review. Here we go. This is that time. What is it: It’s an English red wine. Where’s it from: Denbies Wine Estate is based in Dorking, Surrey. Find out about the estate here. I’ll tell you some more: I’d suggested to Nicola that she might prefer a white wine. In England and Wales whites can be fabulous. Our climate is changing and the growing conditions for our grapes are improving. In parallel our wine making skills and investment are also on the up. I’ve never been a fan of English reds. Saying that, the lovely but temperamental pinot noir grape, which prefers cooler climates and goes into a massive sulk if it gets too warm, is our second most planted grape variety behind chardonnay. Have a look at some stats from the English Wine Producers here. 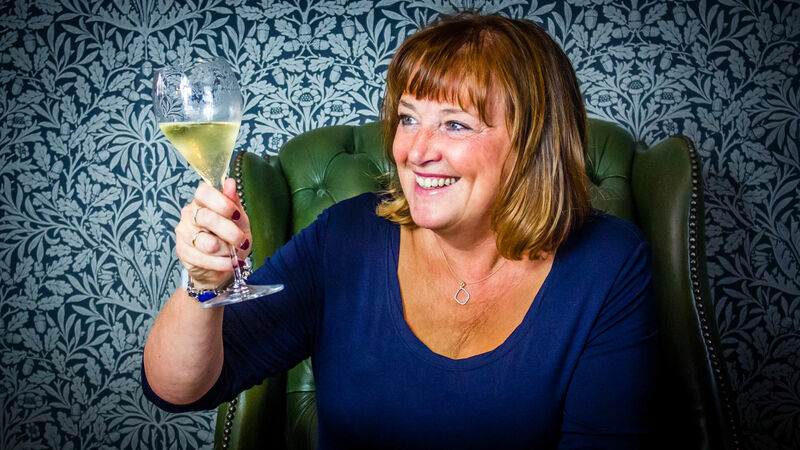 ability to produce first class still wines” and they “have worked hard in the vineyards and winery over the past ten years to push the boundaries”. The grapes: Pinot noir is half of this wine’s blend, with rondo and dunkelfelder having an almost even split of the remainder. What of the taste? I’m just off to open the bottle. I’ll be back. Denbies Redlands is a ruby red and you can see your fingers through the wine in the glass and read words on the other side. It has jammy aromas, a bit like Beaujolais, with a hint of savoury creeping in at the back. It tastes of red fruits and cherries with some spice. Tannins aren’t overpowering and the acidity is good. Pinot noir does its thing here. It is a wine which doesn’t posture and pose bossily but the fruit flavours disappear quickly and it feels a bit “manufactured”. I’m left wanting some more personality. The small print: Denbies Redlands 2014 is 12% abv and is screwcap. It is £12.99 in Waitrose and can be bought online here. As an aside: I sent this list of 2016 award-winning English reds to Nicola and guess which wine I spotted there. 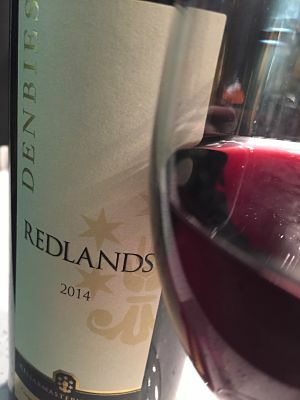 Yes, Denbies Redlands 2014 – a Decanter silver winner.